"Heroes" is the 12th studio album by English musician David Bowie, released on RCA Records on 14 October 1977. The second installment of his Berlin Trilogy recorded with Brian Eno and Tony Visconti, "Heroes" continued the ambient experiments of Bowie's previous album Low (released earlier that year) and featured the contributions of King Crimson guitarist Robert Fripp. Of the three albums, it was the only one wholly recorded in Berlin. "Beauty and the Beast" / "Sense of Doubt"
It was well received by critics, and was named NME Album of the Year. The title track remains one of Bowie's best known and acclaimed songs. Recorded at Hansa Tonstudio in what was then West Berlin, "Heroes" reflected the zeitgeist of the Cold War, symbolised by the divided city. Co-producer Tony Visconti considered it "one of my last great adventures in making albums. The studio was about 500 yards [460 metres] from the Berlin Wall. Red Guards would look into our control-room window with powerful binoculars." Earlier in 1977, Kraftwerk had name-checked Bowie on the title track of Trans-Europe Express, and he again paid tribute to his Krautrock influences: the title is a nod to the track "Hero" on the album Neu! '75 by the German band Neu! – whose guitarist Michael Rother had originally been approached to play on the album – while "V-2 Schneider" is inspired by and named after Kraftwerk's Florian Schneider. Masayoshi Sukita's cover photo was inspired by German artist Erich Heckel's Roquairol. 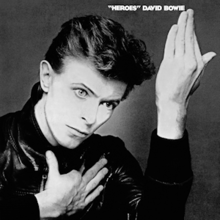 Bowie said that the quotation marks in the title "indicate a dimension of irony about the word 'heroes' or about the whole concept of heroism". Brian Eno instigated Robert Fripp's involvement. "I got a phone call when I was living in New York in July 1977," the guitarist recalled. "It was Brian Eno. He said that he and David were recording in Berlin and passed me over. David said, 'Would you be interested in playing some hairy rock 'n' roll guitar?' I said, 'Well, I haven't really played for three years – but, if you're prepared to take a risk, so will I.' Shortly afterwards, a first-class ticket on Lufthansa arrived." Upon arriving at the studio, and suffering from jet lag, Fripp recorded a guitar part for "Beauty and the Beast": this first take was used in the song's final mix. Although "Heroes" continued Bowie's work in electronic and ambient music styles and included a number of dark and atmospheric instrumentals such as "Sense of Doubt" and "Neuköln", it was regarded as a highly passionate and positive artistic statement, particularly after the often melancholy Low. The lyrics for "Joe the Lion", written and recorded at the microphone "in less than an hour" according to Visconti, typified the improvisational nature of the recording. Eno employed his Oblique Strategies cards during the recording of the album. Stories suggest they were used during the recording of instrumentals such as "Sense of Doubt". RCA Records marketed "Heroes" with the slogan "There's Old Wave. There's New Wave. And there's David Bowie ..." It enjoyed a positive critical reception on release in late 1977, Melody Maker and NME both naming it "Album of the Year". It reached No. 3 in the UK and stayed in the charts for 26 weeks, but was less successful in the US where it peaked at No. 35. The album was released in Germany with the title track renamed ""Heroes"/"Helden"" and partly in German. An early instance of the album's enduring influence is John Lennon's comment in 1980 that, when making his album Double Fantasy, his ambition was to "do something as good as "Heroes"." Rolling Stone highlighted Eno's contribution, contending that after Bowie's "auteurist exploitation" of the former on Low, "Heroes" "prompts a much more enthusiastic reading of the collaboration, which here takes the form of a union of Bowie's dramatic instincts and Eno's unshakable sonic serenity". Several songs from the album were played live on Bowie's Isolar II Tour in 1978, released on the live album Stage the same year, and again from a different venue in 2018 with Welcome to the Blackout. Philip Glass adapted a classical suite, "Heroes" Symphony, from this album as a companion to his earlier Low Symphony. The title track has been covered by numerous artists, for example as an encore by subsequent incarnations of King Crimson, and Billy Mackenzie sang "The Secret Life of Arabia" in 1982 for the B.E.F. LP Music of Quality and Distinction. Several tracks were used in the film Christiane F. Bowie performed as himself in the film. The cover of Bowie's 2013 album, The Next Day, is an altered and obscured version of the "Heroes" cover. This version has "Heroes" crossed out and Bowie's face obscured by an opaque white box reading "The Next Day". All tracks written by David Bowie except where noted. "Heroes" was first released on CD by RCA Records in the mid-1980s. It was reissued in 1991 by Rykodisc with two bonus tracks. The 1991 edition was released in the UK on CD, cassette and LP by EMI Records, and was subsequently rereleased on a numbered 20-bit SBM AU20 Gold CD edition. A further CD release in 1999 by EMI/Virgin, without bonus tracks, featured 24-bit digitally remastered sound. In 2017, the album was remastered for the A New Career in a New Town (1977–1982) box set released by Parlophone that September. It was released in CD, vinyl, and digital formats, as part of this compilation and then separately in February 2018. A volume shift in the 2017 remaster of the song "Heroes" received ire from fans and critics, but Parlophone proceeded to describe as intentional and unalterable, because of damages in the original master tapes. After the critical voices would not lessen, a statement was released on the official Bowie website announcing corrected replacement disks for the "Heroes" CD and LP; the replacement disc offer lasted until June of 2018. The amended remaster featured on the replacement discs was also used for the standalone CD and LP release of "Heroes" in February 2018. ^ "Ranking: Every David Bowie Album From Worst to Best". Consequence of Sound. 8 January 2016. ^ Blackard, Cap; Graves, Wren; Manning, Erin. "A Beginner's Guide to David Bowie". Consequence of Sound. Retrieved 29 March 2016. ^ a b Mastropolo, Frank. "The History of David Bowie's Berlin Trilogy: 'Low,' 'Heroes,' and 'Lodger'". Ultimate Classic Rock. Retrieved 29 March 2016. ^ Pegg, Nicholas (2006). The Complete David Bowie (4th ed.). London: Reynolds & Hearn Ltd. p. 312. ISBN 1-905287-15-1. ^ a b c Pegg, Nicholas (2000). The Complete David Bowie. pp. 307–309. ^ a b Buckley, David (1999). Strange Fascination – David Bowie: The Definitive Story. pp. 320–325. ^ Snow, Mat (2007). MOJO 60 Years of Bowie, "Making Heroes". p. 69. ^ a b c Carr, Roy; Murray, Charles Shaar (1981). Bowie: An Illustrated Record. pp. 91–92. ^ "UNCUT interview". Bowie Golden Years. 1999. Archived from the original on 5 October 2009. Retrieved 19 July 2015. ^ Shaar Murray, Charles (1977). "NME interview". Bowie Golden Years. Archived from the original on 5 October 2009. Retrieved 20 August 2007. ^ Hughes, Rob (February 2015). ""Prog? It's a prison"". Classic Rock. p. 73. ^ Preston, Andrew. "David Bowie's biggest fans reveal all". Daily Mail. London. Retrieved 20 May 2013. ^ "Low". Bowie Golden Years. Archived from the original on 28 February 2017. Retrieved 12 June 2007. ^ Pegg, Nicholas (2000). The Complete David Bowie. p. 112. ^ Erlewine, Stephen Thomas. "Heroes – David Bowie". AllMusic. Retrieved 18 January 2010. ^ "David Bowie Part 1: The 1960s and '70s". Blender (47). May 2006. ^ Christgau, Robert (1981). "David Bowie: "Heroes"". Christgau's Record Guide: Rock Albums of the '70s. Ticknor and Fields. ISBN 0-89919-026-X. Retrieved 18 January 2010. ^ Robbins, Ira (1 November 1991). "Heroes". Entertainment Weekly. Retrieved 14 July 2016. ^ Fadele, Dele (11 September 1998). "David Bowie – Station To Station/Low/Heroes/Stage". NME. Archived from the original on 17 August 2000. Retrieved 14 July 2016. ^ Dombal, Ryan (22 January 2015). "David Bowie: "Heroes"". Pitchfork. Retrieved 22 January 2015. ^ Sheffield, Rob (2004). "David Bowie". In Brackett, Nathan; Hoard, Christian (eds.). The New Rolling Stone Album Guide (4th ed.). Simon & Schuster. pp. 97–99. ISBN 0-7432-0169-8. ^ Griffiths, Nick (September 1991). "David Bowie: Low / Heroes / Lodger". Select (15): 80. ^ a b Sandford, Christopher (1997). Bowie: Loving the Alien. Time Warner. pp. 182–193. ISBN 0-306-80854-4. ^ Gittens, Ian (2007). "Art Decade", MOJO 60 Years of Bowie. pp. 70–73. ^ Testa, Bart (12 January 1978). "Heroes". Rolling Stone. Archived from the original on 9 January 2016. Retrieved 7 July 2016. ^ "A NEW CAREER IN A NEW TOWN (1977 – 1982) - David Bowie Latest News". DavidBowie.com. 12 July 2016. Archived from the original on 30 May 2014. Retrieved 21 February 2018. ^ "David Bowie / Remastered 'Berlin' albums available separately next month". superdeluxeedition.com. 19 January 2018. Retrieved 21 February 2018. ^ "Parlophone respond to David Bowie 'Berlin' box set mastering criticisms". SuperDeluxeEdition.com. 3 October 2017. Retrieved 19 October 2017. ^ ""Heroes" album update". DavidBowie.com. 11 October 2017. Archived from the original on 3 March 2018. Retrieved 19 October 2017. ^ a b "Breaking down David Bowie's 'Heroes' - Track-by-track". BBC Arts. BBC. Retrieved 31 January 2016. ^ a b Kent, David (1993). Australian Chart Book 1970–1992. St Ives, NSW: Australian Chart Book. ISBN 0-646-11917-6. ^ "Austriancharts.at – David Bowie – Heroes" (in German). Hung Medien. Retrieved August 18, 2018. ^ "Top RPM Albums: Issue 5508a". RPM. Library and Archives Canada. Retrieved August 18, 2018. ^ "Dutchcharts.nl – David Bowie – Heroes" (in Dutch). Hung Medien. Retrieved August 18, 2018. ^ "Offiziellecharts.de – David Bowie – Heroes" (in German). GfK Entertainment Charts. Retrieved August 18, 2018. ^ "Italiancharts.com – David Bowie – Heroes". Hung Medien. Retrieved August 18, 2018. ^ "Charts.org.nz – David Bowie – Heroes". Hung Medien. Retrieved August 18, 2018. ^ "Norwegiancharts.com – David Bowie – Heroes". Hung Medien. Retrieved August 18, 2018. ^ "Spanishcharts.com – David Bowie – Heroes". Hung Medien. Retrieved August 18, 2018. ^ "Swedishcharts.com – David Bowie – Heroes". Hung Medien. Retrieved August 18, 2018. ^ "David Bowie | Artist | Official Charts". UK Albums Chart. Retrieved August 18, 2018. ^ "David Bowie Chart History (Billboard 200)". Billboard. Retrieved August 18, 2018. ^ "Dutch charts jaaroverzichten 1977" (ASP) (in Dutch). Retrieved 2 April 2014. ^ "Les Albums (CD) de 1977 par InfoDisc" (in French). infodisc.fr. Archived from the original (PHP) on 21 February 2014. Retrieved 29 January 2012. ^ "Canadian album certifications – David Bowie – Heroes". Music Canada. Retrieved 31 January 2014. ^ "British album certifications – David Bowie – Heroes". British Phonographic Industry. Retrieved 31 January 2014. Select albums in the Format field. Select Gold in the Certification field. Type Heroes in the "Search BPI Awards" field and then press Enter.